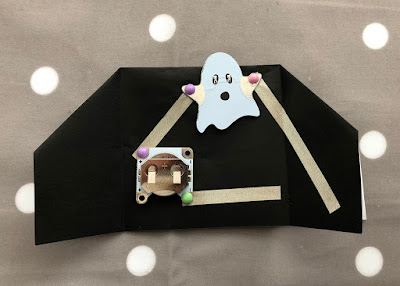 Combining craft and electronics is our thing here at Tech Age Kids and we couldn't resist making a Spooky House craft with the cute Ghost LEDboard from Teknikio. 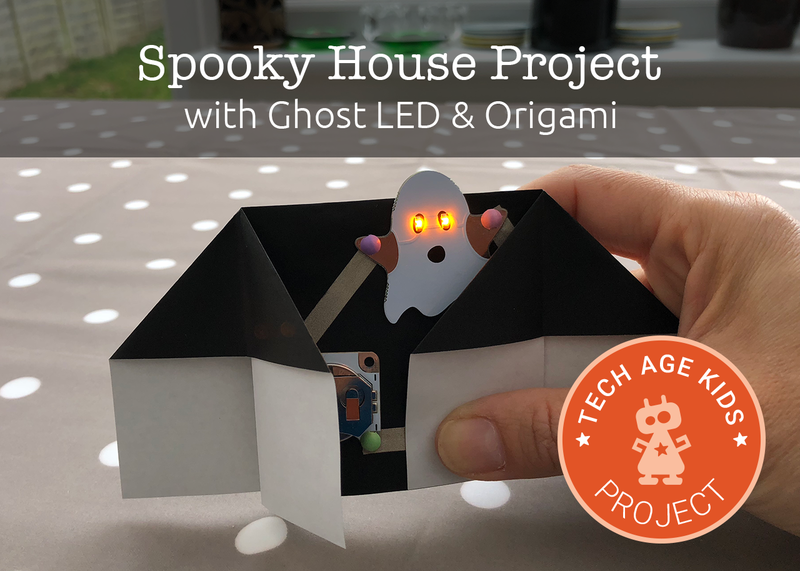 In this project we've combined origami and electronics to make a cute Spooky House project which is super easy to make, but also educational as kids learn how to connect a simple circuit with an LED and a switch. 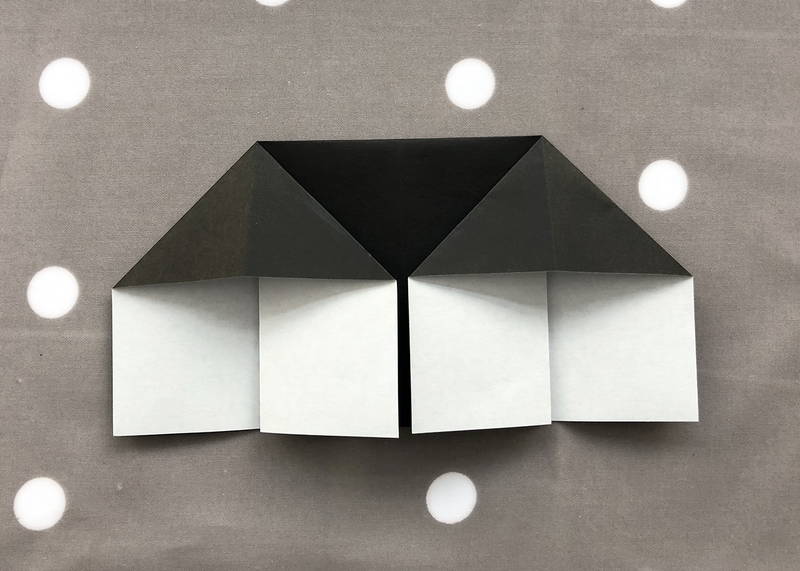 Origami is a brilliant skill for children to master, but you need to start with simple projects, so they don't feel defeated. A popular activity in our house is watching Youtube instructional videos on how to make origami models. We always have a pack of origami paper available when we feel the need to fold some objects! You will fold a simple Origami house and add electronics made by Teknikio. 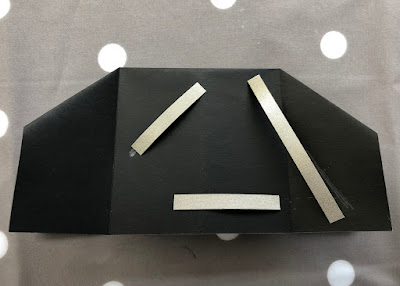 Square of Origami paper (we used black). Any size will work, it will determine the final size of the house in the end. Ours was 15cm x 15cm. 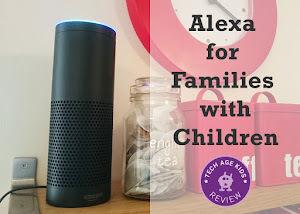 Place the electronics on the paper and trace where the tape will go with a pencil. You're going to create a switch by leaving a gap in the tape. 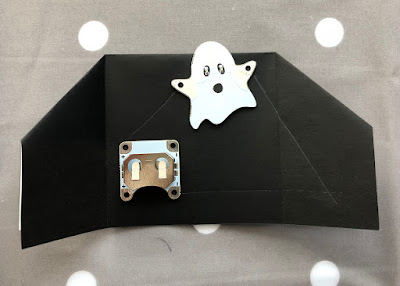 Remember: The positive conductive pad of the battery board needs to connect to the positive pad on the Ghost LEDboard. You can use either of the two positive pads on the battery board. Cut the conductive tape to size and stick on the paper. Your circuit should look like this. Secure the battery board to the tape using the mini paper fasteners. Note you can use either one of the positive and negative conductive pads. Now secure the Ghost LED. 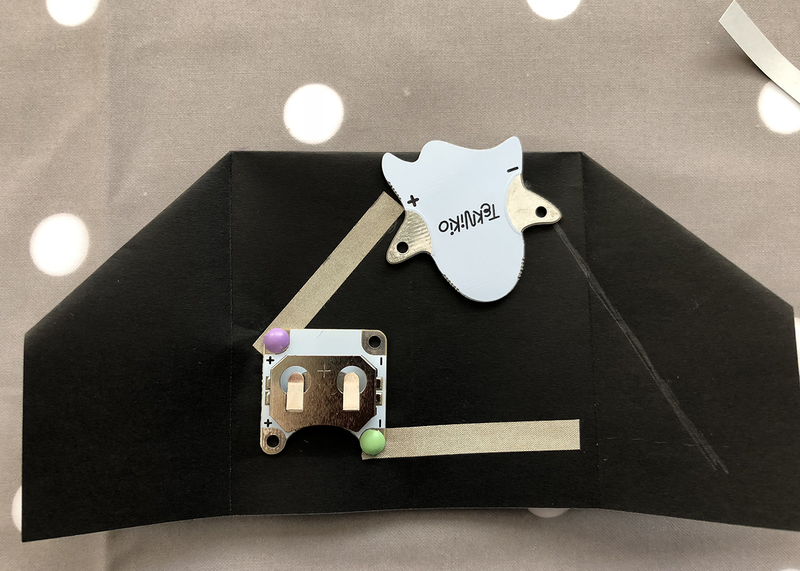 The paper fasteners hold the components in place, so you don't need glue or sticky tape. Do you spot the gap in the tape? That is our switch. 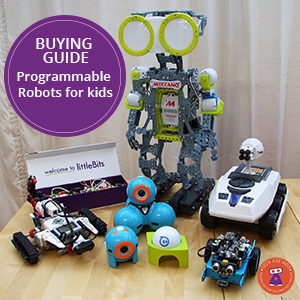 Place a coin cell battery into the battery board. Make sure it's the right way around. Fold the house back again and now press the right side down. Your Ghost LED eyes should light up. By pressing down you are closing the circuit loop. 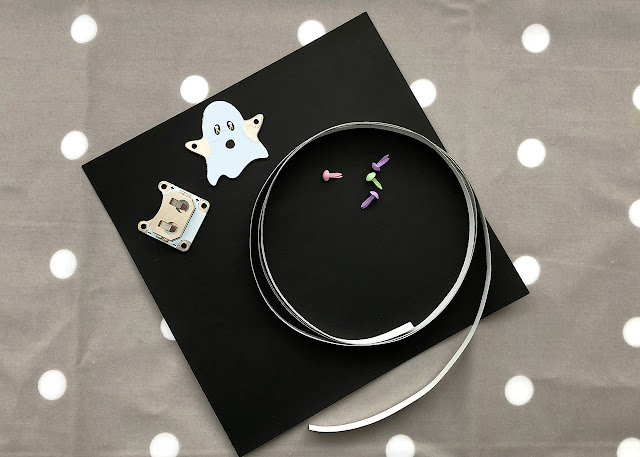 If you can't get hold of Teknikio components, you can use copper tape and sewable electronic components. 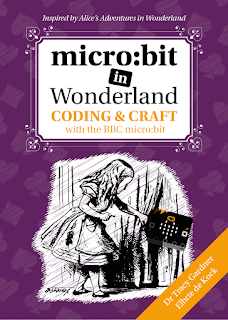 See our Cross-Stitch with eFashion electronics project for more information. 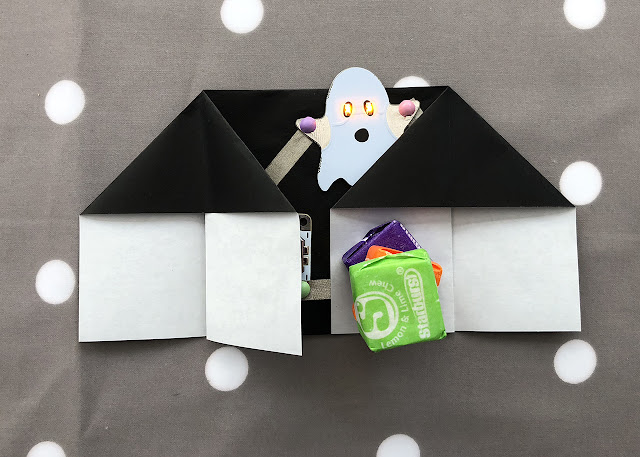 Make this Spooky House for a Halloween themed party and test how many sweets you need to weigh down the house to make the connection and light up the eyes of the Ghost.